The 4th of July is upon us, and it’s time to show your patriotism everywhere — yes, even with your food! 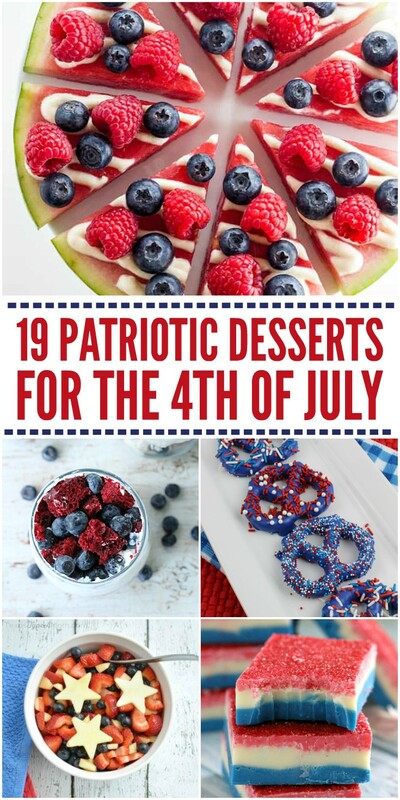 These red, white and blue patriotic desserts are the perfect touch to any 4th of July cookout or party. From healthy options to decadent desserts, you’ll find something amazing to serve your guests here. Which one of these delicious sweets do you plan to make first? The patriotic fudge and the watermelon pizza look amazing to me! 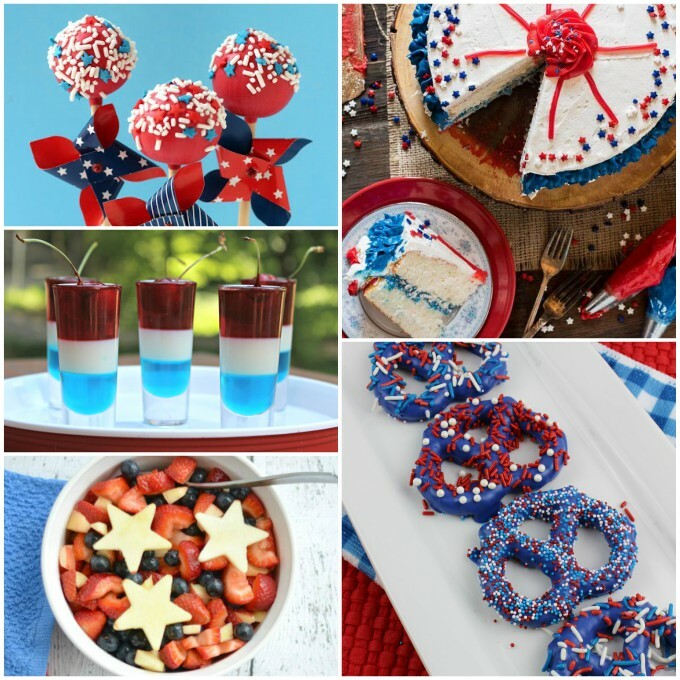 Patriotic Fruit Platter – Create a fun American flag display with red and blue fruits and white pretzels, marshmallows, etc. Patriotic Cookie Dough Truffles – What a delicious little bite-sized treat! And they’re no-bake, so they’re super easy to whip up in a flash. Patriotic Fudge – Doesn’t this look decadent? I love the colored sugar on top to give it a little sparkle. Icebox Berry Cheesecake – Here’s another no-bake dessert for the holiday. Icebox cakes are my favorite summertime dessert! Patriotic Cupcakes – These cupcakes are not only patriotic on the outside, but they’re red, white, and blue inside as well! 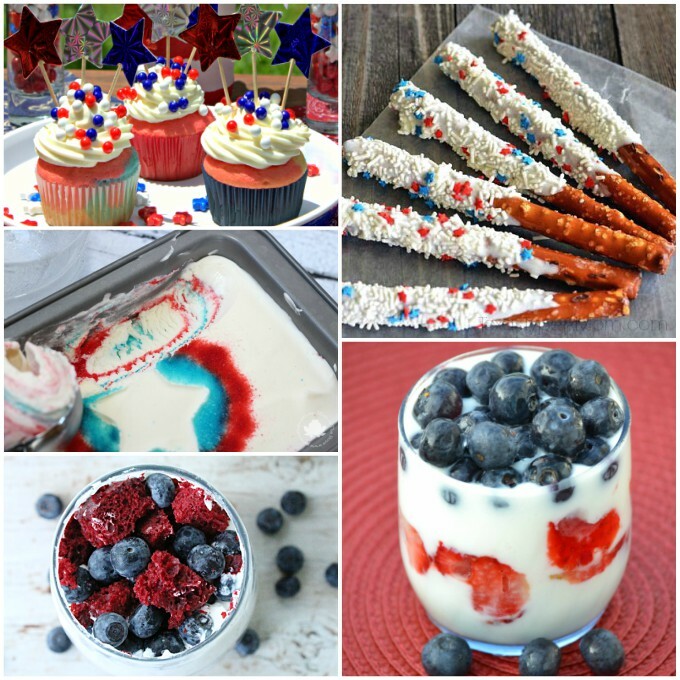 Patriotic Jello Swirl Ice Cream – Captain America fans will LOVE this! The star shape and red, white, and blue ice cream is so much fun. Red Velvet Blueberry Parfaits – A little healthy, a little naughty. This parfait looks amazing. Patriotic Dipped Pretzel Rods – Pretzel sticks are a great treat for the kids. Just dip the ends in white chocolate and add some red, white, and blue sprinkles to make them festive. Easy Patriotic Fruit Parfaits – Blueberries, strawberries and yogurt mix for a healthy treat to serve the kids on the 4th. It’s a yummy breakfast idea. Patriotic Whoopie Pies – YUM! Guests will gobble up these frozen treats. Patriotic Fortune Cookies – These will be so much fun at your 4th of July cookout. Guests will love reading their fortunes for the second half of the year, and the chocolate coating makes the fortune cookies a little tastier. Patriotic M&M’s Cookie Pizza – A delicious dessert that looks like Captain America’s shield. This would be perfect for a superhero party, too. Patriotic Watermelon Pizza – For a healthier option, make one (or several!) of these watermelon pizzas. 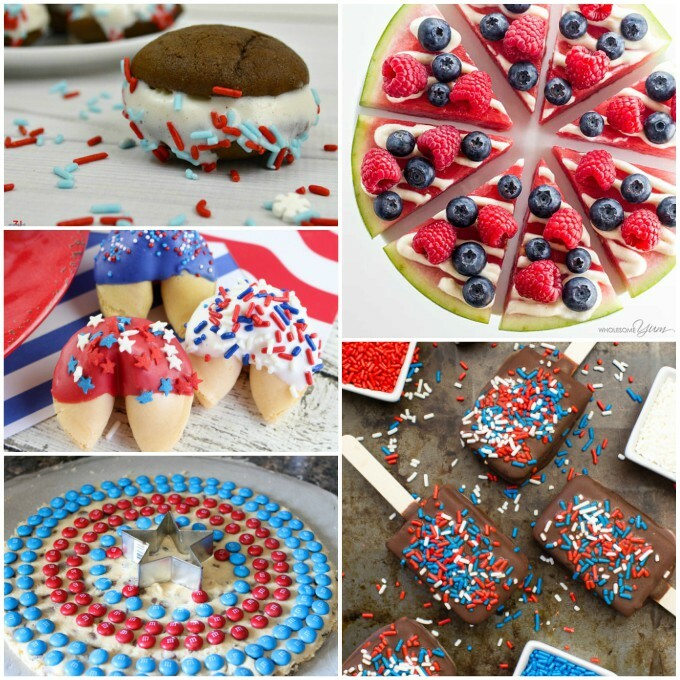 Patriotic Ice Cream Magic Shell Sandwiches – Putting the ice cream sandwiches on sticks and dipping them in magic shell makes them extra sweet and so much easier to eat. Patriotic Pretzels – These blue pretzels are gorgeous, and I love the sweet/salty combo they provide. 4th of July Cake Pops – An easy-to-eat treat for the kids enjoy as they play. 4th of July Jello Cups – Dress up your typical Jello dessert with layers of red, white, and blue. Patriotic Fruit Salad – A healthy fruit salad means no guilt on Independence Day. Enjoy something sweet without blowing your diet! Easy Patriotic Cake – This gorgeous cake is surprisingly easy to make, and it’ll definitely add some “wow factor” to your get-together. Let us know which dessert you make! Thank you for including my M&Ms Cookie! 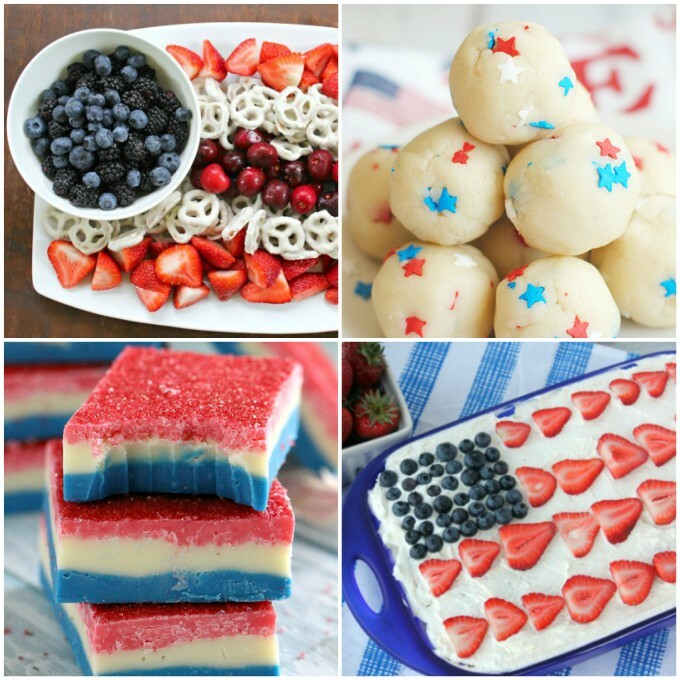 This is a great collection of 4th of July desserts! Thanks again! It looks amazing, Carrie. Thanks for commenting!